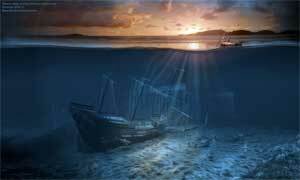 Pirates & Privateers : How much gold do you think there is at bottom of the sea at this time from acts of piracy or boats sunken for other than criminal reasons? Do you think it is possible to bring all that gold to the surface? Question of Alexandre (07.10.2015): How much gold do you think there is at bottom of the sea at this time from acts of piracy or boats sunken for other than criminal reasons? Do you think it is possible to bring all that gold to the surface? A: The seas are the largest warehouses of treasures. More than 40% of Spanish galleons have never returned to their country. A portion was not lost and went on to join the coffers of the King of France or the Queen of England, or the pirates. But much became the victim of the ocean. Before you can bring up all the gold you have to locate it. Then you have to have a lot of money to find the men and equipment needed to reach the gold. Some people know of some wrecks, but jealously guard their secret.